Did you know that a rare frog, the Growling Grass Frog, has been re-discovered in Merri Creek in Fawkner? Join MCMC’s Waterwatch Coordinator for a walk and talk and froggy activities. You'll learn to recognise different frog calls and help collect important data for Melbourne Water's Frog Census. Families are most welcome. The event involves walking and will still take place even if it rains, so please bring weather appropriate clothing for the event (Frogs love rain so don’t be put off by a rainy evening). Bookings are now closed. This event is funded by Melbourne Water. Meet at gate opposite 111 Metrolink Circuit, Campbellfield, (Melway 180 K12 - see Google map) Park on the factory side (check the No Parking signs), or ring ASAP to arrange a car pool. 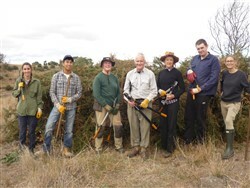 Feel the immediate rewards of liberating this native grassland from woody weeds, such as Gorse. You’ll also see the big mob of kangaroos that always show up. Light refreshments provided. Phone Ray 0422 989 166. Organised by Friends of Merri Creek and supported by Merri Creek Management Committee and Parks Victoria. our financial bottom line was positive! Photo above: Herne Swamp after heavy rain, Mt Fraser in background. Sept 2016. Herne Swamp is a hidden gem on the upper Merri Creek awaiting the opportunity to be brought 'back to life'. Lying to the south and east of the town of Wallan it has 'all the ingredients required for a spectacular restoration project'. This is the central point made in an inspiring discussion paper from the Nature Glenelg Trust - Restoration Vision for the Wallan Wallan wetlands, including Herne Swamp, as the centrepiece of the Wallan Wallan Regional Park. The Nature Glenelg Trust are experts in wetland restoration and were invited by local community members to inspect Herne Swamp in 2018.